Sthapatya Veda embraces the concept of the holistic origin of the universe. It expounds the principles involved in the areas of Vastushastra (architecture and planning), Shilpashastra (sculpture and iconography), Chitrakala (painting in all branches). It envelops within it, the knowledge of Jyotis, Ayur-Veda and Gandharva Veda etc. and tenets of Samudhrika Shastra and other branches of Vedic knowledge. 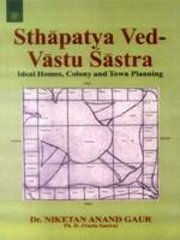 Niketan Anand Gaur is a Sthapatya Ved-Vastu Sastra expert, author of Vedic Vastu Vdiya Evam Rogakarak Vastudosh; Sthapatya Ved Vastu Sastra ka Vaigyanik Evam Adhyatmik Vishleshan; Sthapatya Ved Vastu Sastra Vedic Vangmaya se Anth Sambandh.